To Sum It Up: With Valentine no longer a threat, Jace and Clary can finally be together—or so they think. Clary worries that Jace is withdrawing into himself more and more, and she’s at a loss to help him. Meanwhile, Simon is grappling with the consequences of not only being a still fairly new vampire, but one who can walk in the daylight and who bears the Mark of Cain, which will destroy anyone who tries to harm him. And there are several people who seem determined to harm Simon. Review: During my first read of books 1-4 of The Mortal Instruments three years ago (yikes—has it been that long already?! 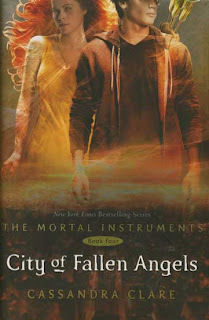 ), City of Fallen Angels quickly established itself as my least favorite TMI book. Jace was not the Jace I fell for in City of Bones. His plotline in CoFA revolves around the mystery of what’s wrong with him, and the first time I read this book, I hated that plotline. Like, dude has been through enough already, what with being raised by an insane, murderous megalomaniac who popped back into his life and continued making it an absolute hell. A depressed and brooding Jace was a chore to read about; his sarcasm and arrogance, while not entirely absent, have been the hallmarks of this series for me. Maybe knowing what to expect with Jace made rereading CoFA okay. I mean, there were a few things that I still felt iffy about, like the introduction of a character from Maia’s past. I don’t have a problem with Maia; it’s the necessity of adding yet another secondary character that I’m unsure about. And just when you thought Jace and Clary were going to kill demons side by side happily ever after, this book happened. Even if the Angel himself played matchmaker, something would get in the way of these two being together forever. Although my opinion of the above-mentioned aspects of CoFA didn’t soften with a reread, I do feel that overall, the book is more finely honed than its predecessors, both in terms of the writing and the pacing. The exchanges between Jace and Simon, which have always been heavy on the snark, were particularly snappy, in multiple senses of the word. Speaking of Simon, he really takes center stage in this novel, and I remember being slightly annoyed by this the previous time I read CoFA, because as much as I like Simon, the lack of Jace-ness was palpable. This time, however, I really felt for Simon. He’s the odd man out—not a Shadowhunter, not the average vampire thanks to being a Daylighter. And almost everyone seems to want to kill him. So, lots of sympathy for Simon, whose luck in this book eerily resembles Jace’s, i.e. bad. Going into this rereread, I was pretty sure that CoFA was going to fall fairly short of the 4 stars I gave to the other three TMI books. As I read, though, the book suprisingly held up quite well. I wouldn’t go so far as to say CoFA has become one of my favorite TMI books, but I was way too hasty in assuming that I was going to be rather tough with the rating. Besides, CoFA marks the first TMI appearance of a certain Silent Brother . . . .
All in All: City of Fallen Angels actually improved upon a second read, but that was largely due to knowing the story beforehand. I wasn't very happy with this book. I thought the books were supposed to be a trilogy (right?) then because of its success this came out. It's okay but Clary and Jace were even more annoying!! Ugh! Sorry, if you love them, I can't take Clary and Jace's emo-ness! I love the secondary characters though. There have been many times when Jace and Clary's relationship drama became too much for me. I like Jace a lot; Clary- not so much. But, I do think the series turned around after this book and is very much worth seeing through to the end. I never re-read this one. I did the first three over and over again, but not this one. I was so ticked off when I read this book. It's just that feeling of when a character can never catch a break. Great review! Jaclyn @ JC's Book Haven. I was really nervous when City of Lost Souls first came out because I could not have handled a repeat of this book. Luckily, I enjoyed book 5 a lot. I do remember thinking the first time I read this, "Why Jace?!" The poor guy just seemed destined to be miserable, lol.